Department of Pharmacology, School of Pharmacy, AIKTC, New Panvel, Maharashtra, affiliated to Mumbai University, INDIA. Research Scholar, Department of Pharmaceutical Sciences, JNTUH, Kukatpally, Telangana, INDIA. Department of Pharmacognosy, Oriental College of Pharmacy, Navi Mumbai, INDIA. Ficus religiosa, Ficus benghalensis and Ficus glomerata are plants from Ficus species used traditionally for the treatment of various ailments. This study aimed to investigate in vitro antidiabetic and antioxidant activity of three plants from Ficus species and effect of extracting solvents, total flavonoids and phenolics content on its in vitro activity. Dried leaf powder was extracted successively by using solvents with increasing order of polarity index (PI). In vitro antioxidant (RP: reducing power assay, DPPH: 2,2-diphenyl-1-picrylhydrazyl assay and HP: Hydrogen peroxide assay) and antidiabetic (αA: α-amylase assay and αG: α-glucosidase assay) activities as well as total flavonoid (TF) and total phenolic (TP) contents of extracts were evaluated. The correlation between in vitro activities and solvent polarity index, total flavonoid and phenolic content were established by using pearson’s correlation coefficient (R). Strong positive correlation was observed with PI of extracting solvents and TP content of Ficus religiosa (PI/TP, R=0.8159) and Ficus glomerata (PI/TP, R=0.9172). 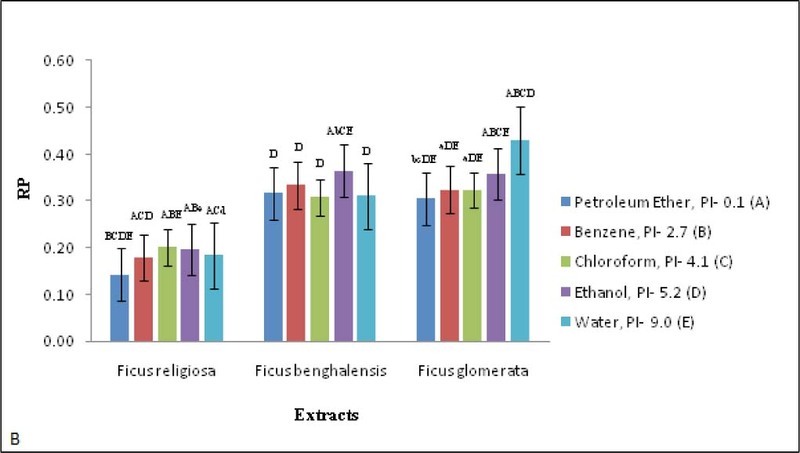 Comparatively benzene and water extracts of Ficus glomerata were found to have significantly (P<0.05) highest in vitro antidiabetic and antioxidant activity respectively. Strong positive correlation was observed between TF and αG inhibitory (TF/ αG, R=0.793) effects of Ficus benghalensis. In addition, strong positive correlation observed between TP and antioxidant activity (TP/DPPH, R=0.9744; TP/RP, R=0.9514 and TP/HP, R=0.8108) of Ficus glomerata. Finding of our research will help in selection of solvents for extracting antidiabetic and antioxidant rich phytoconstituents from Ficus species. Plants are source of abundant natural bioactive phytochemicals with health-promoting activities like anti diabetic, antioxidant, anti-inflammatory, antibacterial, antihypertensive, analgesic etc. Flavonoids and phenolics compounds are most widely occurring groups of phytochemicals present in plants. There were several studies that reports biological activity of these group of phytochemicals. In addition, extensive research is being conducted to investigate new plant related drugs and to identify appropriate extracting solvent for extraction of phytoconstituent with desired pharmacological action. Diabetes is a serious metabolic disorder affecting millions of life.1,2 A number of studies showed that the diabetes mellitus associated oxidative stress lead to various macro and microvascular diabetic complications.3,4 Plants belong to the Ficus species are well known in traditional system of medicine. Few of such plants are Ficus religiosa, Ficus benghalensis and Ficus glomerata. Extract of these plants from different extracting solvents were reported for treatment of diabetes, stomach ache, piles, skin diseases, ulcer, dysentry, inflammation, oxidative stress and cancer.5 One of the reasons for activities of these plants extracts might be due to presence of varying proportion of different phytoconstituents that depends on the selection of appropriate extracting solvents. The present research work is undertaken to study comparative in vitro antidiabetic and antioxidant activities in the petroleum ether, benzene, chloroform, ethanol and water extracts of leaf of Ficus religiosa, Ficus benghalensis and Ficus glomerata. In addition, this study includes comparative quantitative estimation of total flavonoids and phenolics content in the extracts. α-glucosidase, α-amylase enzymes, p-nitropheynyl-α-glucopyranoside and DPPH were purchased from Sisco Research Laboratories Pvt. Ltd. Whereas all other chemicals were purchased from SD Fine Chemicals, Mumbai, and were of AR grade. The leaves of Ficus religiosa, Ficus benghalensis and Ficus glomerata were collected from Sindhudurg district of Maharashtra, India. The specimens were authenticated by Dr. A. S. Upadhye of Agharkar Research Institute, Pune, India. The leaves were dried in shade and powdered using mixture grinder. The powder leaf material was successively extracted with the solvents of increasing order polarity such as petroleum ether, benzene, chloroform, ethanol and distilled water. All the extracts obtained are preserved in desiccators for future use. Total flavonoids content was determined using the method of Ordon et al.6 A volume of 0.5 ml of 2% AlCl3 ethanol solution was added to 0.5 ml of sample solution. After one h at room temperature, the absorbance was measured at 420 nm using Jasco UV-VIS spectrophotometer. Total flavonoids content was calculated as mg/g QE. Total phenolics content in the extracts were determined by the modified Folin-Ciocalteu method as described by Wolfe et al.7 Extracts (100 μl ) was mixed with 5 ml Folin-Ciocalteu reagent and 4 ml (75 g/l) of sodium carbonate. The tubes were vortexed for 15 sec and allowed to stand for 30 min at 40°C for colour development. Absorbance was recorded against reagent blank at 765 nm using Jasco UV-VIS spectrophotometer. Total phenolics content were expressed as mg/g GAE. The reducing power was determined according to the method of Oyaizu.9 2.5 ml of extracts (0.1 mg/ml) dissolved in methanol were mixed with 2.5 ml of 200 mmol/l sodium phosphate buffer (pH 6.6) and 2.5 ml of 1% potassium ferricyanide. The mixture was incubated at 50°C for 20 min. After 2.5 ml of 10% trichloroacetic acid (w/v) were added, the mixture was centrifuged at 650 rpm for 10 min. 5 ml of upper layer was mixed with 5 ml of water (deionised) and 1 ml (0.1%) ferric chloride, and the absorbance was measured at 700 nm. The higher absorbance indicates higher reducing power. All the determinations were performed in triplicate. Statistical analysis was performed using one way ANOVA followed by post-hoc Tukey’s HSD Test at the significance level P < 0.05 and P < 0.01. Data were also evaluated using Pearson’s correlation coefficients to identify relationships between total flavonoids, total phenolics contents and in vitro antioxidant and antidiabetic activities of leaves of Ficus species. Phytochemicals such as phenolics and flavonoidal compounds present in the various herbs are well known for its antioxidant and antidiabetic activity.9 For this reason there are interests in using phenolics and flavonoids rich extracts in the treatment of diabetes and its complications. In present study five different solvents including petroleum ether, benzene, chloroform, ethanol, water with increase in order of their polarity index were used. Polarity of extracting solvents have significantly (P < 0.05) affected both measured total flavonoids and phenolics content. Total flavonoids content is varied from 361.45 to 93.96 mg QE/g, whereas total phenolics content is varied from 144.04 to 4.50 mg GAE/g of extract. When total flavonoid content of each extract was compared, chloroform extract of Ficus religiosa and Ficus glomerata extracts were found to have significantly (p<0.05) higher content of total flavonoids (Figure 1A). 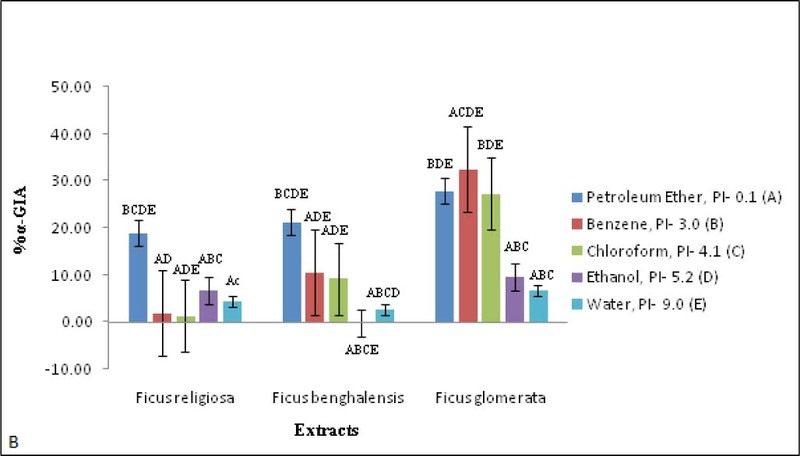 However, when the phenolics content of each extract was compared with the others, water extract of Ficus glomerata and ethanol extract of Ficus religiosa were found to have significantly (p<0.05) higher phenolics content (Figure 1B). Strong positive correlation was found between polarity index of extracting solvents and phenolics content of Ficus religiosa and Ficus glomerata (Table 1) which indicate the role of more polar solvent in extraction of phenolics compound. However, weak negative correlation was found between polarity index of extracting solvents and phenolics content of Ficus benghalensis. This different trend indicates that the phenolics content may change from species to species. Moderate to strong negative correlation was found between polarity index of extracting solvents and flavonoids content in all three Ficus species which indicate the ability of less to moderate polar solvents in extracting flavonoidal compounds (Table 1). Total flavonoids content of leaves of Ficus species. Total phenolics content of leaves of Ficus species. Figure 1: Total flavonoids content (A) and total phenolics content (B) of leaves of Ficus species. Data expresses as mean ± SEM (n=3). Lower case letters indicate significant differences of P < 0.05 and capital letters indicate significant difference of P <0.01 as compared to different solvent extracts. PI: Polarity index, TFC: Total flavonoids content, TPC: Total phenolics content, QE: Quercetin equivalent, GAE: Gallic acid equivalent. In vitro antidiabetic activity of each extract was estimated by α-amylase and α-glucosidase inhibitory assay. The α-amylase and α-glucosidase inhibitory activities of extracts were found to be significantly (P < 0.05) differ among the tested plants. Significantly high α-amylase inhibitory and α-glucosidase inhibitory activity was found with benzene and chloroform extract of Ficus gloemrata (Figure 2A and 2B). 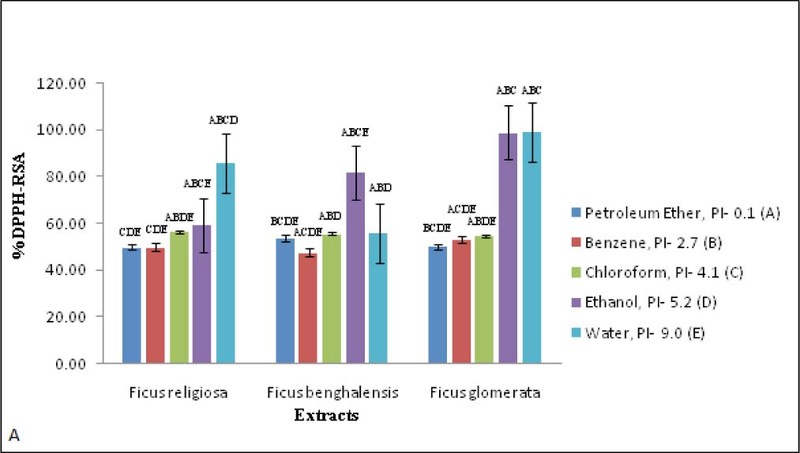 Three negative values of α-amylase inhibition were observed with benzene and chloroform extracts of Ficus religiosa and ethanol extract of Ficus benghalensis (Figure 2A). Also there is one negative value of α-glucosidase inhibition was observed for ethanol extract of Ficus benghalensis (Figure 2A). This indicates activation of these enzymes by the respective extracts rather being inhibited. This type of negative value of enzyme inhibitions was also reported by Bahman N et al.13 Overall in both the assay benzene extract of Ficus glomerata showed highest inhibition of both the enzymes. 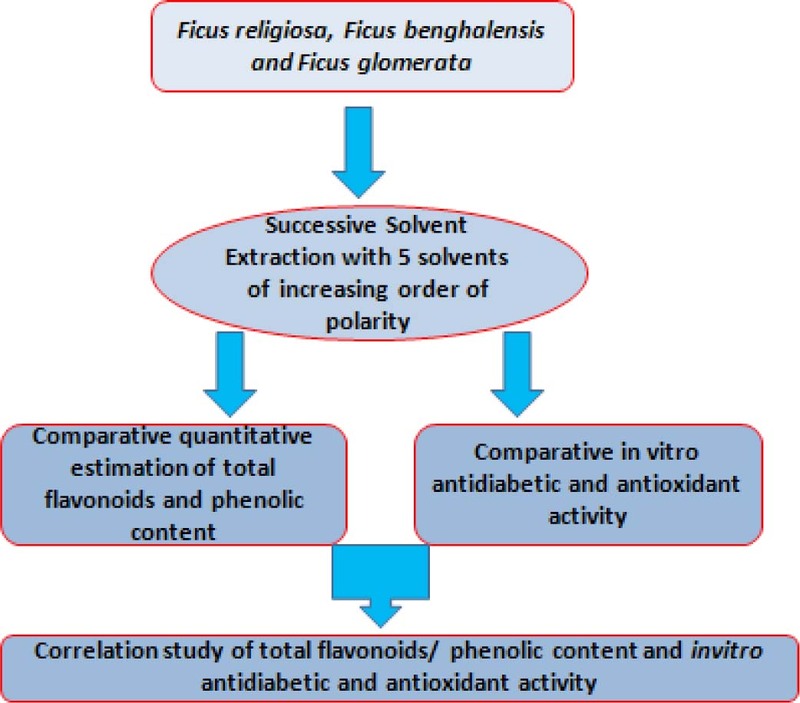 Moderate to strong positive correlations were found between total flavonoids content and α-amylase and α-glucosidase inhibitory activities of Ficus benghalensis and Ficus glomerata (Table 2) which indicate that the presence of flavonoids in the extract might be responsible for their activity. α-amylase and α-glucosidase are the main enzymes responsible for the conversion of starch to more simple sugars. Thus, the inhibitors of these enzymes delay carbohydrate digestion and reduce the rate of absorption of glucose. As a result, this type of drugs can control postprandial rise in blood glucose level. The antioxidant activity of each extract was monitored by using the DPPH radical scavenging assay, reducing powers assay and hydrogen peroxide radical scavenging assay. 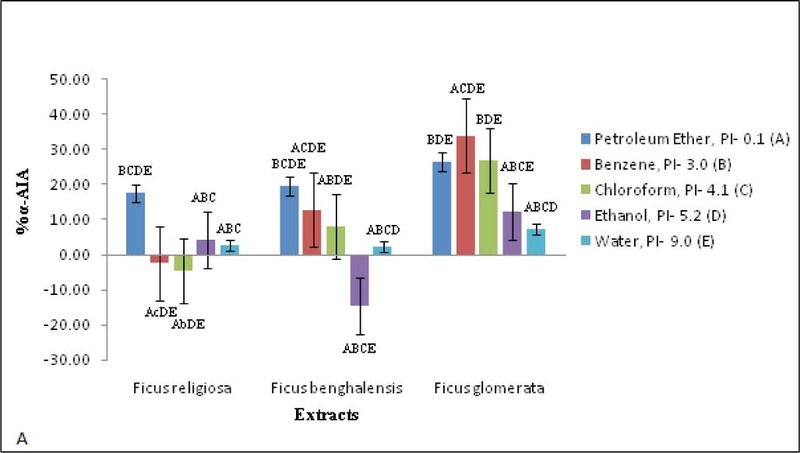 All the tested plant extracts of Ficus species exhibited significantly different (P < 0.05) antioxidant activities (Figure 3A, 3B and 3C). Percentage DPPH and hydrogen peroxide radical scavenging activity of extracts were found to be in the range from 99.02 to 47.51 and 49.43 to 38.98 respectively. Whereas reducing power of extracts expressed as absorbance at 700 nm were found to be in the range from 0.4294 to 0.1422. 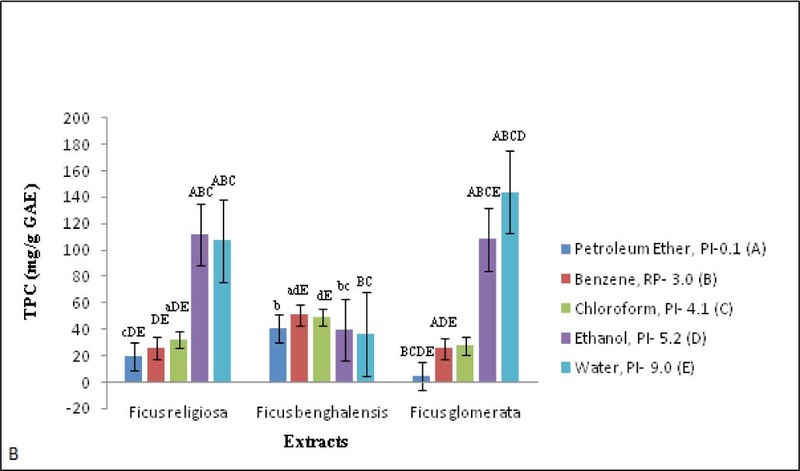 When DPPH and hydrogen peroxide radical scavenging activity of extracts was compared, water, ethanol extract of Ficus glomerata and water extract of Ficus religiosa respectively showed significantly (p<0.05) high antioxidant activity (Figure 3A and 3C). 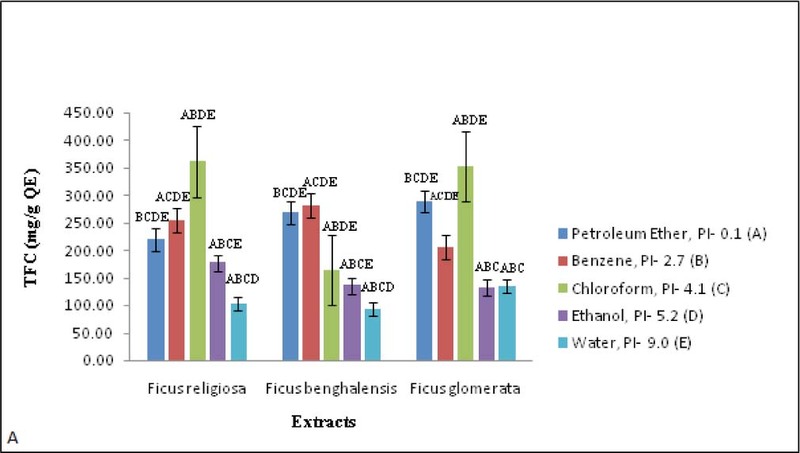 When reducing power of extracts were compared, water extract of Ficus glomerata and ethanol extract of Ficus bengalesnsis showed significantly (p<0.05) high reducing power (Figure 3B). Overall in all antioxidant activity assays water extracts of Ficus glomerata showed highest antioxidant activity. 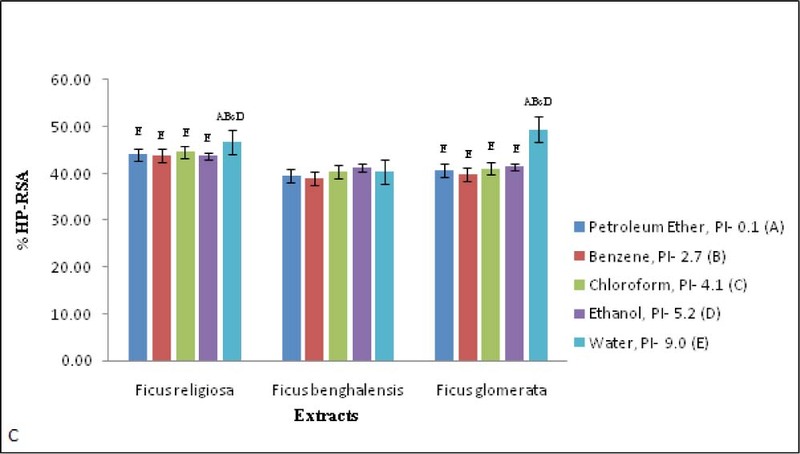 Moderate to weak correlations were observed between phenolics content and antioxidant activity of Ficus religiosa whereas strong positive correlation was found between phenolics content and antioxidant activity of Ficus glomerata (Table 3) which indicate that the presence of phenolics content in the extract might be responsible for its antioxidant activity. Pearson’s correlations coefficient among polarity index of extracting solvents and total flavonoids and total phenolics content of leaves of Ficus species. Data expressed as Pearson’s correlations coefficient (R) between PI of solvents selected for extraction and TF and TP content, mean (n=3) of respective plants calculated by using Pearson’s correlation coefficient calculator. PI: Polarity index TF: Total flavonoids, TP: Total phenolics. In vitro α- amylase inhibitory activity of leaves of Ficus species. α- glucosidase inhibitory activity of leaves of Ficus species. Figure 2: In vitro α- amylase inhibitory activity (A) and α- glucosidase inhibitory activity (B) of leaves of Ficus species. Data expresses as mean ± SEM (n=3). Lower case letters indicate significant differences of P < 0.05 and capital letters indicate significant difference of P <0.01 as compared to different solvent extracts. PI: Polarity index, α-AIA: α- amylase inhibitory activity, α-GIA: α- glucosidase inhibitory activity. Pearson’s correlations coefficient among total flavonoids content and in vitro antidiabetic and antioxidant activity of leaves of Ficus species. Data expressed as pearson’s correlations coefficient (R) between TF, mean (n=3) content and in vitro antidiabetic and antioxidant activity of respective plants. TF: Total flavonoid, α-AIA: α- amylase inhibitory activity, α-GIA: α- glucosidase inhibitory activity, DPPH-RSA: 2, 2-diphenyl-1-picrylhydrazyl - radical scavenging activity, RP: Reducing power, HP-RSA: Hydrogen peroxide – radical scavenging activity. Pearson’s correlations coefficient among total phenolics content and in vitro antidiabetic and antioxidant activity of leaves of Ficus species. Data expressed as pearson’s correlations coefficient (R) between TP Content, mean (n=3) and in vitro antidiabetic and antioxidant activity of respective plant extracts. TP: Total phenolic, α-AIA: α- amylase inhibitory activity, α-GIA: α- glucosidase inhibitory activity, DPPH-RSA: 2,2-diphenyl-1-picrylhydrazyl - radical scavenging activity, RP: Reducing power, HP-RSA: Hydrogen peroxide – radical scavenging activity. In vitro DPPH radical scavenging activity leaves of Ficus species. In vitro reducing power assay of leaves of Ficus species. Figure 3 (C): In vitro hydrogen peroxide radical scavenging activity of leaves of Ficus species. The present findings not only showed comparative in vitro antidiabetic and antioxidant activity of three plants from Ficus species but also give clear idea about the effect of extracting solvents, total flavonoids and phenolic content on in vitro antidiabetic and antioxidant activities of these plants. Among all analyzed leaf extracts, Ficus glomerata leaf extracts showed comparatively high in vitro antidiabetic and antioxidant activity. However, further in vivo studies are needed to confirm the potential of these plants in the treatment of diabetes and oxidative stress related disorders. Total flavonoids and phenolics content of leaves of three Ficus species were significantly different depending on the types of plant and polarity of solvents used for the extraction. More polar solvent like water seems to be more effective in extracting phenolics content from the leaves. In addition, it should be also noted that statistically significant strong positive correlation was observed between phenolics content and antioxidant activities of Ficus glomerata. Ficus religiosa (Ashvatha), Ficus benghalensis (Nyagrodha) and Ficus glomerata (Udumbara) are few of the reputed panchavlkal drugs of ayurveda belonging to the family of Moraceae. In vitro antioxidant activity of different extracts of these plants has been conducted by DPPH radical scavenging, reducing power and hydrogen peroxide radical scavenging assay. In addition, in vitro antidiabetic activity was also evaluated by using α-amylase and α-glucosidase inhibitory assay. Quantitative phytochemical estimation of total flavonoids and phenolic content has been done to evaluate its correlation with in vitro antioxidant and antidiabetic activity. Present study revealed in vitro antioxidant and antidiabetic activity of various extracts from Ficus species. Although these plants are related to the same species but widely differ in their in vitro activities as well as total flavonoids and phenolic content. The author wish to thanks Dr. Abdul Razak Honnutagi, Director, AIKTC and Dr. Shariq Syed, Dean, SoP, AIKTC for providing facilities to carry out this work. Conflicts of interest CONFLICT OF INTEREST We declare that we have no conflict of interest.